Anterior cruciate ligament surgery and rehabilitation have undergone dramatic changes over the past decade, due to extensive clinical experience, improved surgical technique and better understanding of the rehabilitation process. Pre and post-operative rehabilitation is a major factor in the success of ACL reconstruction. Early restoration of full joint movement and weight-bearing are of paramount importance for successful rehabilitation. The aim is to ensure a complete understanding of the basic principles of the ACL reconstruction, to restore the full range of motion, near normal strength and to mentally prepare the patient for the operation and accelerated rehabilitation. It is very important that the patient takes an active part in the rehabilitation, both before and after the operation. The ACL prevents the shinbone from sliding forwards beneath the thighbone. A diagnosis of ACL injury is based on a thorough physical examination of the knee. The exam may include several tests to see if the knee stays in the proper position when pressure is applied from different directions. An X-ray and MRI (magnetic resonance imaging) or, in some cases, arthroscopic inspection will confirm a diagnosis of a torn ACL. A partial tear of the ACL may or may not require surgical treatment. A complete tear is more serious. Complete tears, especially in younger athletes, may require reconstruction. Immediately after the injury you should rest the knee. This reduces swelling and bleeding and helps prevent further injury. You should then apply ice to your knee (ice cubes in a plastic bag or a packet of frozen peas are ideal – tied on, but not too tight). The ice should be applied for 10-15 minutes twice hourly and repeated several times a day. The effect of the ice is to reduce the swelling by causing your blood vessels to contract. It also helps to reduce pain and muscle spasm by numbing your nerve endings. Don’t overdo the ice however as this will start to have the opposite effect. Keep light pressure on your knee during icing (perhaps with a supportive bandage) and keeping your knee lifted up on a footstool both help to reduce swelling. Applying heat, massage or creams to an acutely swollen knee is not a good idea. This will increase blood supply and make your pain and swelling worse. The pain and swelling will normally go away within a couple of weeks but your knee will probably feel unstable, as if it might give way each time you put weight on that leg. This instability can be treated by physiotherapy, using braces, or, if necessary, by surgery. You may have injured other parts of your knee at the same time as your ACL – particularly your cartilage (or meniscus). This is a rubbery substance that acts as a shock absorber between the bones in the knee. If this is damaged you may find it painful to walk and, in time, a cartilage problem may lead to the knee joint wearing out. May be used because of a patient’s age or overall low activity level. 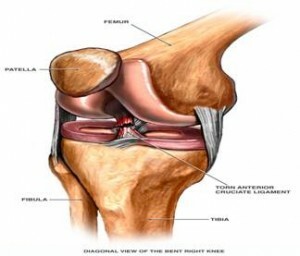 After surgery your knee will be swollen and painful. Your physiotherapist will begin a rehabilitation programme immediately. Physiotherapists and surgeons are constantly improving their understanding of how best to rehabilitate knees which have undergone ACL reconstruction. Generally, rehabilitation programmes are getting faster so that almost immediately after the operation you will be asked to undertake mild exercise of the knee. By doing this your knee is prevented from becoming stiff which would prolong your rehabilitation. Of course, whilst your knee is still sore from the operation it is more painful to undertake rehabilitation exercises. This is one of the reasons we stress the importance of a good mental attitude. A small amount of effort on your part will be rewarded with superior results from your surgery. It is common after surgery to have swelling of the whole lower leg, extensive bruising and some numbness both around the scars and going down the inner side of the shin. These symptoms will gradually reduce over a few weeks although you may be left with a patch of numbness around the scars. The objective is to reduce swelling, regain muscle control of your leg, restore your normal gait as well as the ability to extend and flex your knee. Initially your physiotherapist will concentrate on getting you upright and weight bearing with support and trying to get you to walk without limping. Now the objectives are to stop using crutches, gain confidence and strengthen the knee whilst restoring full flexion. Typical exercises will include stair climbing, static cycling, knee bends and lunges. Weights will be introduced and you may begin to swim but do not breast stroke until you are medically cleared to do so. The objective is for you to return to a full level of activity at any chosen sport. Three to four months of sports training may be required before you are in condition to compete effectively. Naturally the above is only a guide and will be tailored by your physiotherapist to your progress and to the instructions that we give. 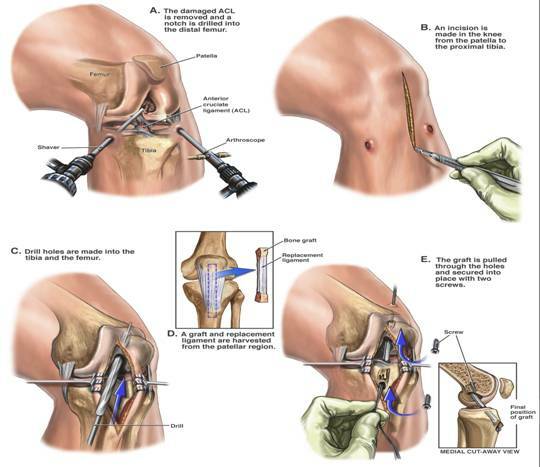 ACL surgery is complicated by infection in less than 1% of cases. You will be given antibiotics to decrease that risk. If you notice fevers, increased pain or night sweat you should contact us. Please talk to Professor Haddad before your operation if you have concerns about possible risks.